The Seven of Pentacles appearing in a Reading acknowledges that you have indeed been working very hard and have put much effort into an area of your life. My, my, haven’t you been a busy beaver. Hard working, ambitious and tenacious too. Well, I come to give you some good news and that is, you will very shortly begin to see the results of all your hard labour. You have toiled hard and long in the field and now your harvest is almost in. Success is only a short distance away and you have probably being seeing signs of it for some time now. It looks to be very promising indeed. It has been a long time coming and has certainly taken much out of you. However, you are not exactly there yet as there are still some things to attend to before you can reap the rewards of all your toil. Regardless, the worst of the work is over now and you should be able to ease up a bit. You should feel very confident now of positive results for you are not here by chance. The Seven of Pentacles does not bring success lightly. You have worked extremely hard to get to this stage. Determination, conviction and commitment have dragged you through some pretty grim stages for the task you have taken on, is by no means small. There is a chance that you had not envisaged it to be so relentless in its demands upon you and your resources but when the going got tough, you never gave up. You are now at a stage where you can see the finish line in the distance which is wonderful and certainly encouraging but there is also the tendency to feel impatient and frustrated. This part cannot be rushed as failure to adequately attend to the finishing stages may result in a poorer return or result than expected. What is left to do is more than likely mind-numbingly boring and there may be days now where you wish you had never started. You might feel that it has sapped everything from you and still wants more, but perseverance and tenacity will save the day. You are nearly home and dry so don’t give up. You have gone this far and The Chariot of The Major Arcana, demands you go the rest. Therefore, you must finish anything that you have started regardless of how boring they may have become. They are all part of the process and equally important to the more exciting aspects of your goal or ambition. It will all be worth it in the end and when your harvest comes in it is bound to be bountiful and possibly more than you anticipated. Keep going and don’t give up for you are on the brink of seeing great results and a successful outcome . (The above reminds me of some years ago when I decided that I would dig out my own garden and lay a patio. I had been given several quotes which to be honest were out of the question. I decided I would do it myself, so set about with my shovel and wheelbarrow. At first I made good progress but then the ground became increasingly rocky and hard to dig. After that I discovered that the garden was uneven and before I could lay my patio slabs, it had to be sorted. This would entail me going back over areas that I had already worked on. I felt like throwing the towel in as the task had become way more than I expected. The garden was half-dug, half not. I had gone too far to walk away from it as it was a mess. I wearily went back to the beginning and used a spirit level to make sure I was keeping it level. I had to constantly remind myself why I was doing it. I had to visualise my Goal daily. Just as I was getting somewhere with the levelling, I snapped a muscle in the back of my calf and had to be carted off to hospital. It had just gone pop. I ended up in a plaster cast and had to face the possibility that I could no longer continue with the garden. I can tell you, I came very close to giving up but I had put so much effort into it that it seemed inconceivable that I should have wasted so much of my time not to mention injuring myself in the process for it all to amount to nothing. So. determined and very possibly insane, I wrapped my plaster cast leg in a black plastic sack and sat in the middle of all the soil with nothing but a trowel to dig with. The neighbours thought I was mad but I was going to finish the garden if it was the last thing I did. Well, my leg eventually healed as the garden levelled and like the Man in the imagery, I stood back to take it all in. Yes, the Seven of Pentacles augurs well for Success as a result of hard work and effort but impatience is also strongly linked to this Card. In the imagery we see the Man in the field struggle with the dilemma of harvesting his crop early for fear it may be destroyed should he leave it too long. He is worried that he may lose all he has invested on a physical and material level. What this means to you in a Reading is that you may be in a situation where you are impatient to get your return, share or cut. Fear of failure or loss may catapult you forward into making impulsive decisions. As a result you could sabotage your potential success. You could be tired of waiting for an insurance policy to mature and worried about the erratic state of global markets. Should you cash it in too soon, you are guaranteed to suffer a significant financial loss. Then again, you may be coming to the end of a long drawn out Court Case and have worked hard to ensure that you get Justice. You may have been standing your ground and made certain financial demands against your opponents. As the case draws to a close, you may panic about losing all. You may have to decide whether to accept the inadequate settlement the other side are offering or hold out for the Courts to decide in your favour. If they don’t then you may get nothing after all the effort you have put in. The choice, of course is yours, but when the Seven of Pentacles is Upright its message would be to ‘Hang on in there’. If you have done the proper groundwork, homework and invested wisely then you will reap the rewards. Now is not the time for quitting or pulling out. You may live to regret it. However, you may wish to review your situation to see if there are any alternatives or options other than what is on the table in front of you. The Seven of Pentacles suggests that you are in a very advantageous position. Again, this is not by chance as you must take the full credit for your success. You have put the effort and hard work in the past and here you are today, well set-up. You are bound to be feeling secure within and without. You are now at a crossroads for the work is almost done and you must decide where to go to from here. You may have saved for a long time and are now at the stage of deciding what to do with your money. You could be deciding to build a house, set up a business, buy some land or even get married. Whatever it is you intend to do, the Seven of Pentacles suggests that the money is there for it and plenty more besides. You have nothing to worry about. The Seven of Pentacles asks you to step back from what you have achieved and take stock of what to do with it and your life. You have been working so hard for such a long time that you probably haven’t had much time to think about such things. If you don’t, then you run the risk of being a slave to your goals for ever or just working for the sake of working. You do not need to make any drastic moves or any changes that will destroy all you have worked so hard for. However, you now have the time to raise your head from all the heavy work and take stock of how you proceed from here. There comes a time when we must all put down our tools and take a break. Whatever it is can manage without you for the moment for you have everything in place and well organised. Like the Man in this Card you must reflect or review your work, goal or ambition to date. Be it a Business Plan or Life Plan, it may very well be out of date or in need of some alteration. Check-in with yourself and decide where you are going with what you are doing otherwise you will be toiling away at the same tasks indefinitely. Your work must have a purpose. Your efforts and hard work may very well have brought you the happiness and success you desired but on the other hand, you may possibly feel that it has taken too much out of you. The world won’t end if you put everything on hold for a moment. You really need to assess your goals and see if you are on track or lost in all the toil and sweat. You may have strayed or deviated from the path and now must ask yourself why? Is it because you just kept going without doing spot checks every now and then on your whereabouts or is it because you prefer the off-track route rather than the planned one. Ask yourself, Was the effort worth all the hard work? Will you get the harvest you expected? You may look back to where you came from, where you are now and what you plan to do in the future. Like the Man in the imagery, who cuts away any dead or weak offshoots from his Pentacle plant, the Seven of Pentacles may be highlighting the need for you to do the same in your life. You might need to take stock of what is useful or not and what is necessary or not. You may need to simplify your life now and work only on those areas, that from experience, yield positive results. It is not possible to give everything the same level of focussed concentration so single out the areas that mean the most to you and cut back on or clear out the rest. This is also a time for doing a bit of spring cleaning at home and tidying up the garden. The Seven of Pentacles can also suggest that you are overestimating your needs or worrying too much about scarcity or lack of finances. This card assures you that you have plenty to go around and need less to live on than you think. Then again, you may only be allowed access to a small allowance from a greater pot. This may annoy or frustrate you, but be grateful, as it will all be yours one day. It can suggest that you have come into a large sum of money and going back to Card Six, an inheritance may be more than you expect. If you are saving hard for something then you may be living very frugally. The emphasis is on what will be and not on what is. It will require patience and endurance to reach your goal. 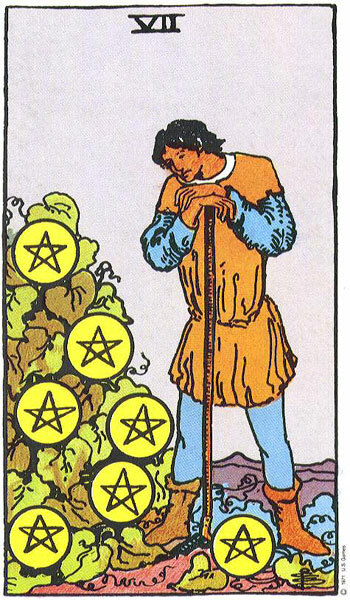 The Seven of Pentacles can symbolise living off the land or farming. You may be growing your own food or suppling local markets. In a Relationship Reading, the Seven of Pentacles indicates that you are reflecting on relationships. You may be thinking about your future as a couple and have plans that need financial consideration. You may be saving to get married or buy a house. You will only get out of your relationships that which you put into it, so this Card can be asking you to consider your commitment to your partner. In the Upright Seven, this is a very positive card and suggests that commited effort is being put into the relationship. It is a labour of love and one which will yield wonderful results. The long-term view is held and an understanding that care, cultivation and nurturing are the keys to a successful relationship. You may have reached a stage in your life where you look back on relationships of the past and compare them to what you have or what you are looking for in future relationships. If you have been working very hard or saving, then the pressure is easing up. You may have more time or cash available to indulge in a little bit of socialising or even romance. The Seven of Pentacles also asks you to be patient in your search for love and suggests that you may have to wait some time before you meet the right person. It will be worth it in the end so do not try to rush into anything. In a Career Reading, this Seven indicates that you are spending time reflecting on your career to date and where you see yourself in the coming years. Depending on how you see yourself in this Card, you may feel you have been well rewarded for all your hard work or that you got very little out of it. Career-wise you may feel that you are getting nowhere or that you made the wrong choice. This may very well be the case but sometimes we need to give it time to take off. You may be inpatient or too much in a rush to get to the top. The best thing to do is set some realistic goals and work towards them. You will be able to gauge your success by doing so. The good news is that no matter how fed up you feel, under-appreciated, over-worked or under-paid you are definitely making progress and circumstances will improve shortly. In work your hard work and effort has not gone unnoticed. You may be in the running for a large bonus or even the offer of a partnership. This Card can represent the PhD Student or Medical Intern who has to slowly work their way to success, with very little financial rewards for all their effort. The focus is on the big picture and what they stand to earn rather than the immediate circumstances. They have committed to their work in the full knowledge and acceptance that it will be many years before they are fully qualified. If in Business, you may be working on a financial plan. If working on a project or your own business you are beginning to see the return from all your hard work. Patience is required now before you get your full rewards. Careful maintenance of your business is essential now, as it is not quite there yet. You may feel that you never thought you would see this day, the day when your business begins to pay off, begins to hold its own, when you are finally beginning to see some positive results. It is a moment to savour. You have done well, but it is not by chance. Careful planning and hard work got you to this point. The Seven of Pentacles generally augurs well for business and is a good indication that it is healthy and thriving. You may not have to work as hard as you did in recent years as it is well now established. However, it can also highlight, depending on surrounding Cards, the need to seriously examine your business to determine areas that need to be weeded or cleared out. Some aspects of your business may have a draining effect on your resources with little profit materialising from them. You may need to be quite ruthless and get rid of anything that is not working. You may have gone too big too soon or have over-estimated the demands for your produce. Attend to market research to see what is hot and what is not and specialise only in your areas of expertise. If you are thinking about starting a Business and the Seven of Pentacles appears in your Reading, it carries very important messages for you. It tells you that your business plan has the potential to be successful and that you have the focus, determination and commitment to follow through with your plans. It advises you to spend time doing the necessary groundwork and not to take any shortcuts. Write a Business Plan and set realistic Goals. Review your Business Plan regularly and be honest with yourself. Only your very best of efforts will do. However, it does warn that success will not happen overnight and that there will be a long road ahead of you. Like the seedlings the Man planted in the Seven, all businesses in the start-up stage go through a period of gestation. The gestation period can be long and arduous. You may spend much time toiling away with just the promise and hope of realising your dream to keep you going. You may be the only one who believes in or has faith in your project. It can be a lonely journey with many potential pitfalls and disasters to overcome. The going can get tough and many will not stay around long enough to see what might have been. If you can endure and persevere then you are on to a good thing but you may not see any results for a long time. Last but not least, the Seven of Pentacles strongly represents being close to retirement and the end of years of hard work, commitment and dedication. The time is coming for you to put up your feet and take a well-earned rest. Leave the hard work to someone else now as you have proved your worth and done all you can. You may be considering what you will do with your free time and how much you will have to live on. In the Upright Seven, your pension fund is healthy and fruitful. If you have investments or insurance policies you may be enjoying the first pay outs or dividends. It all looks very promising and a good sign that you will be well provided for. The money is there for you should you decide to return to study, open a business, travel or even to start a new hobby. When the Seven of Pentacles Reverses it can affect you in several ways so surrounding Cards would need to assist in your interpretation. This Card can be a sign that you have not been looking after the finances very well and are poor at budgeting. You may be spending more than is coming in or have drained your resources or an inheritance. Debts may be mounting and credit cards maxed. 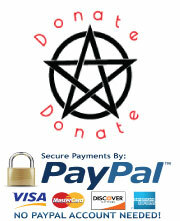 If you take a look at the Card Imagery, you get one solitary Pentacle to live on yet you spend as if you had several. Did you think that money grew on trees? You may be better at spending it than making it. Time to draw a halt and work out some plan of how to sort your finances out. It might take you some time to clear your debts but you have to start somewhere. The Seven of Pentacles can suggest that impatience, frustration and anxiety threaten to get the better of you as you feel you have been waiting forever to see the slightest sign of reward or results for your expended effort. The finish line may be insight but then again, it may have been for some time. However, each time you are just about there, something else pops up that has to be attended to and causes set-backs and delays. It could be a case of ‘one step forward and ten steps back’. A panic could set in leaving you seriously considering walking away from the whole thing. Instead of your workload easing up, it might have got heavier and to the point that you feel it will break your back. You may have underestimated the project or situation you took on, thinking it would only take a certain amount of time, effort, resources or money. Now, it is threatening to bleed you dry and break your back. The more you do, the more there is left to do. There is no way out except to put your head down and keep going. You could be seriously doubting the viability of your plans and are at a loss as to why you ever got involved with it in the first place. There is a possibility with the Seven of Pentacles Reversed that you did not do your sums in advance or take the time to create a workable plan. With no goals, targets or assessments, the whole thing has just drifted along and is now going nowhere. You may be seriously considering washing your hands of the whole thing. It might not be that easy to get out of now. The Chariot of the Major Arcana would be disappointed in you for not taking the reins in your hands right from the beginning. It looks like no one has been at the steering wheel driving it forward. Your Chariot has got stuck in the mud or has lost its way. You may find that you have planted your Pentacles (money/time/resources) in the wrong soil (investment) and instead of growing they wither and die. Your harvest may be in but has not yielded the return expected or has failed altogether. This may be as a result of bad management or lack of experience. However, it could also be down to ‘trying to turn a quick buck’ or a ‘get rich quick scheme’. Then again, you may have thought you were being clever trying to run with something that you really have no clue about. Instead of getting properly trained and taking the time to do your research you might have considered it a piece of cake at the time and thrown your lot in. This Card can also warn against cashing in Insurance or Investment Policies too early. You may be too impatient to wait the full-term. This may result in a lower payout and early payment penalties but it might also be an option to get you out of a financial bind at the time. Your attitude may be that ‘a bird in the hand is worth two in the bush’. You might be in bad need of the money right now. The Seven of Pentacles Reversed can also suggest that you are taking too many breaks and not putting in the required effort to get a successful result. You could be guilty of procrastination, spending more time talking about what you are going to do rather than getting stuck in. You are not working hard enough. It could also be down to pure old laziness. If you had kept on top of things from the start, it would not have built up to this extent. Now you have a mountain of work to do and haven’t a clue where you are supposed to start with it all. Sitting staring at it is not going to get you anywhere. The best thing to do now is give yourself a good kick of the backside and get started. It is not going to get itself done and wishing it away, will get you nowhere either. The best thing to do is sit down and work out some sort of attack plan. Break the big job up into smaller tasks and set yourself a schedule of completion. This will involve you only having to concentrate on a particular task rather than getting overwhelmed by the mountain of work ahead of you. As you complete each task, tick the box or draw a line under it. This will keep you motivated and more in control. Believe me, it will have a knock-on effect on the rest of your life. 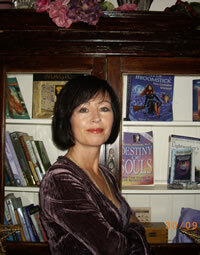 Take for instance, me writing the Truly Teach Me Tarot Course. It took me a while to get into my stride, because for some time, I was trying to do a bit of this and bit of that and then I would become overwhelmed by the amount of work I had taken on (of course, I thought it was going to easier and faster than it has turned out to be. We all fall into that trap). There have been days when I have become almost hysterical with the sheer volume of work and other days when I would rather have sucked razor blades than sit down to my computer. Then I drew up a to-do-list for the week ahead and I try my damnedest best to stick to it. It requires discipline, perseverance and reminding myself constantly of my ultimate goal. Some weeks I have overestimated what I can achieve and therefore have to run a carry-forward list. Then there are weeks when I complete my schedule ahead of time and I give myself permission to go off and do something else (the housework, or work on my dolls) or if I am on a roll, I continue and get ahead of myself for the following week. I feel a lot more in control now and am much better able to chart my progress. This really is one of the messages of the Seven of Pentacles Reversed and echoes The Chariot warning of not getting on board unless you are prepared to go the full journey. However, with all the Reversed Sevens the message of ‘give up’, ‘don’t hang on in there’ is easy to interpret as ‘walk away’ but what it really is saying is that what you are doing is not working, so go find another way to do it, a new approach so to speak. There is a possibility that you will have to down tools in the end as you discover that no matter what way you approach it, it ultimately fails. That is unfortunate and soul-destroying, but you certainly must give it your best shot first and be able to honestly put your hand on your heart and say ‘I tried my best’. There is a tendency with the Seven of Pentacles Reversed to give up when the going gets tough but this results in you going nowhere and will also set a pattern for the rest of your life. With the Seven of Pentacles Reversed, there is also the possibility that you have over-worked a situation. It may all have become an obsession at this stage and even though your work is done, you can’t help going back over it or picking at bits and pieces of it. It has all become a bit of a habit or an addiction. Do you really need to stay in work late every night when everyone else has gone home? Do you constantly re-check your work? This can also be the Artist who just can’t leave his painting alone, an extra dab here and an extra stroke there. The finished product can look too much or too heavy and when the Seven of Pentacles Reverses it can be a subtle hint to tell you that ‘less is more’ . If you work is done, it’s done so just leave it alone. Then again, you might be guilty of creating too much of something. Making more than you need or can cope with. This can be driven by a fear of scarcity and you would need to reflect on the root cause of such behaviour. This can cover a wide variety of areas but as an example, you can be buying more food than there are mouths to feed or days in the week, cooking too much food, overdoing it on ‘the grow your own’ or ‘buying too many clothes. Here we have the tendency to over-estimate and this can create terrible waste if you have no way of off-loading the excess. You may be an habitual hoarder so it may be time to make a few cutbacks and prune some areas of your life. Give the house, attic and closet a good clear-out. Give away anything that you do not need or haven’t used or worn in the last six months. Only keep what you really need and use. Then take a vow not to overdo it again. When you are finished in the house, then out to the garden you go as along with all your lovely plants and flowers you have let the weeds run wild too. 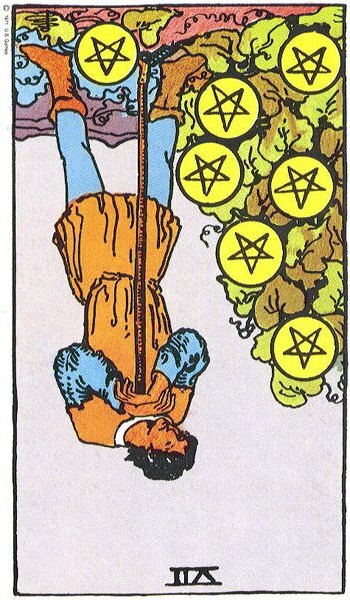 The Seven of Pentacles Reversed can highlight the loss experienced by those who accumulated property and assets during the boom time. In the Reverse, we see the man staring at his property portfolio and all those mortgages that have to be paid. There is a great big heap of them growing on that tree, but this harvest is not his and has probably been repossessed by the banks. Unfortunately the crop may have failed but the Pentacle’s Debt Tree is thriving and demands his attention now more than ever. The land he purchased to grow them on is not worth the paper it is written on at this stage of recession. The small Pentacle in front of him symbolically represents the reduced value of his assets. He still has to tend the worthless crops because they are his responsiblity. They are bound to sap him of everything he has. Working hard can be very rewarding when we can see positive results for our efforts but working with no personal gain can be soul destroying. He could be flogging a dead horse at this stage, but still needs to drag it around with him. Tension and nervousness accompany the Seven of Pentacles Reversed and with it comes a tendency to be on your guard and suspicious. There may be an imagined or real threat of someone trying to take or get their hands on something that you have invested an awful lot of time in. You may feel that you have to keep vigilant. This could easily come down to property or land but it could also be your plans or ideas. The surrounding Cards will give further insight as to what and who is involved. The Seven of Pentacles Reversed can be a sign that you may be putting too much effort into accumulating assets and have lost sight of what is of true value. Enough is never enough as you buy more and more and keep building and building. You may very well end up a slave to your possessions which will ultimately exhaust you. Remember that the more you have, the more you have to maintain. If your garden or crops are thriving then so too are the weeds. Careful control needs to be maintained or it will all get out of hand. You might not be taking the time to reflect on what is useful and what is unnecessary. In Relationships, The Seven of Pentacles Reversed could suggest that you are not giving the time to reflect and therefore repetitive patterns occur in relationships leading to dissatisfaction and disappointment. You may blame everyone else for this but if you just took the time to have a good look you might see where your responsibility lies in this situation and set about making the necessary changes. A change is needed indeed as the Seven Reversed asks you not to hold on to the old way of doing things. This Card often highlights a relationship hitting a rocky patch. It may seem all like a struggle at present and a lot of hard work. Individually and as a couple you will need to reflect on this and see what you can do to break through the rough areas. People and relationships change over time. The old approach may no longer be relevant or suitable. Careful cultivation and maintenance now will ensure that it begins to thrive again. There is also the possibility that you are so busy with work and your career you are not giving enough time to your relationship. It may have lost its value to you. You partner could see you as someone who is a workaholic and never at home. There is bound to be a loss of intimacy and connection. You could be too tired and exhausted for anything but food and sleep by the time you get home. If you have not been maintaining your relationship or giving it enough attention then rot may have set in. A previous healthy and thriving relationship could be overrun with weeds and disease. As it withers, bitterness, resentment and suspicion are the only things flourishing. Then again you might be very ambitious and have chosen a career ahead of seeking a relationship. You may work very hard indeed and earn a lot of money but end up with very little for yourself once the household and family expenses are met. You could feel like a drudge, constantly cleaning up after your partner and kids, endless housework and laundry to sort, the sweeping brush or Hoover forever in your hand. No matter what effort you make you never quite get on top of it and by the time you get through all the chores it is time to start them all over again. You really need a break or just some me time. As a couple saving to get married or to buy a house, impatience might set in or the tedium of living frugally becomes unbearable. You might be fed up with it all and possibly change your mind. You might choose a less expensive wedding or not get married at all. If saving to buy or build a house, you may be tempted to dip into your savings or down-scale the size of the project as you get frustrated with the wait. There may be a considerable change of plan or moving of goal posts. You could forget all your plans and spend the money on setting up a business, a new car, study or travelling the world instead. Career wise, The Seven of Pentacles can suggest that you are working just for the sake of working but with no plan of action or thought given to your future. You may be just drifting through life, in and out of work every day but have little ambition. There may be problems with a project causing delays and setbacks. This is bound to be incredibly frustrating. A job may have over-run causing extra expense and less profit or there is a possibility that the quote under-estimated the cost and time involved. You may feel you are working for nothing. You may have spent your whole life working hard for others watching them get wealthier while enjoying the fruits of your labour. This may leave you feeling bitter and resentful as you look at the pittance you receive (lone Pentacle) for your efforts. You need to sit down and have a good think about what you want to do and what changes need to be implemented for you to get it. It seems like you have been putting in a lot of effort but with no reward. This Card Reversed, can highlight a job where there are no perks or incentives for employees. Your work could be tedious, repetitive and heavy but then again it may simply suggest that you have a heavy workload at present. Retirement may not be an option when The Reversed Seven of Pentacles appears as set-back, delays or policies change. If you do work hard then there may be slackers around you who get away with blue murder. You may be left to tidy up their mess and carry the extra workload of their laziness. Your boss may make a habit of dumping extra assignments on you at a moments notice just when you thought you had finished for the day. You will have to have a good think about why you are letting this happen as it is making you feel very weary and resentful. It is time to change this arrangement. Either speak up or find a job where everyone pulls their weight. In Business, you may be struggling to survive. After all the hard work and money spent, there might be little profit or return. You will need to step back from what you are doing and work out why this has happened. Is it that you have not invested wisely? Did you take on more than you could cope with? You may have overestimated your abilities or skills or perhaps you thought you could make a quick buck or killing? You may have to review your Business Plan and take stock of what has gone wrong. You might just need to make a few changes here and there or there may be need for more radical reform. There could be areas of your business that are having a draining effect, causing too much work and expense with little return. It might be time to make some overdue cut-backs to weed out the unhealthy areas. This could just come down to a change in market demand following the recession and not as a result of bad business management. Your business may have been healthy and thriving prior to this but is now struggling to stay afloat. There is no use standing there scratching your head and hoping that it will sort itself out. Action is required now and the sooner the better. You might need to let go of your old way of doing things as they are no longer appropriate or relevant in these times. You may be producing more goods than are in demand or trying to sell in an overflooded market. It is essential that you reflect on where your business is going as it is not working for you in the way it should. It might also be time to review your staffing levels. Do all your staff pull their weight or are there some known to slack off when you are not around? Cut-back or pruning of staff that are not earning their keep may also be on the Cards. You could be investing in all the wrong places because you don’t know what you are doing. Your business may be drifting along, with management and staff unfocused and lethargic. You may spend more time dreaming or talking about setting up a business than actually doing anything about it. Then again, your business may be exhausting you. You may feel overwhelmed by the workload or are trying to do too much singlehandedly. There is a possibility that you have turned into a workaholic and have nothing else in your life. You may need a break or vacation badly but either can’t or won’t take one. You might also have a habit of starting up businesses only to abandon them at the first sign of trouble. This is usually down to bad planning and poor market research but also could be as a result of cash flow issues. You may have had no contingency plan in place with no ‘rainy day’ money set aside. You may not have had enough start-up capital behind you, dipped into the profits too soon and forgot to re-invest. You probably lack the staying power to be successful in business. You might like the status and prestige of being a business owner but are work shy.